On the 12th (Sat), take in the dramatic scenery at Rainbow Falls, take in the dramatic natural features at Thurston Lava Tube (Nahuku), then hike along Kilauea Iki Trail, and finally examine the collection at Jagger Museum. Get ready for a full day of sightseeing on the next day: surround yourself with nature on a nature and wildlife tour. To find ratings, reviews, more things to do, and other tourist information, read our Volcano travel itinerary planner. Los Angeles to Volcano is an approximately 8.5-hour flight. Due to the time zone difference, you'll gain 2 hours traveling from Los Angeles to Volcano. In August, plan for daily highs up to 33°C, and evening lows to 24°C. Finish your sightseeing early on the 14th (Mon) so you can travel to Honolulu. 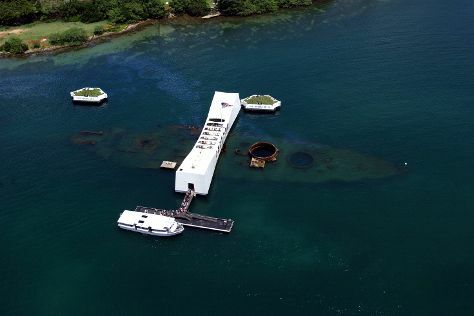 Kick off your visit on the 14th (Mon): pause for some photo ops at USS Arizona Memorial, then take in the pleasant sights at Diamond Head State Monument, and then enjoy the sand and surf at Hanauma Bay Nature Preserve. On the next day, take in the dramatic scenery at Manoa Falls and then tour the pleasant surroundings at Waikiki Beach. To find other places to visit, more things to do, and tourist information, use the Honolulu travel planner. Use the Route module to find suitable travel options from Volcano to Honolulu. In August, daytime highs in Honolulu are 36°C, while nighttime lows are 28°C. Cap off your sightseeing on the 16th (Wed) early enough to travel to Kahului. Kahului is a census-designated place (CDP) in Maui County, on the island of Maui, in the U.S. On the 16th (Wed), admire nature's wide array of creatures at Maui Ocean Center, then stop by Mr. Pineapple, and then contemplate the geological forces at Haleakala Crater. On the next day, relax in the rural setting at Surfing Goat Dairy and then see some colorful creatures with a scuba or snorkeling tour. To see reviews, photos, ratings, and other tourist information, go to the Kahului itinerary planner. Use the Route module to find suitable travel options from Honolulu to Kahului. Expect a daytime high around 36°C in August, and nighttime lows around 26°C. On the 18th (Fri), you'll have the morning to explore before heading back home.